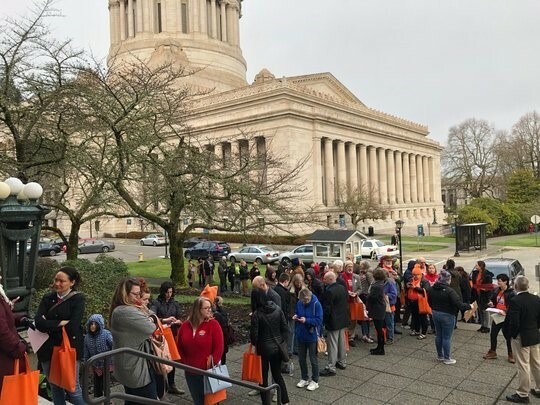 OLYMPIA — The third week of the 2019 session begins with hearings Monday focused on addressing the youth homelessness crisis. Senate Democrats will also focus on school safety, prescription drug prices, oil train safety, voting rights and climate change. The Senate is also scheduled to take its first significant floor votes of the session on Wednesday. Improving public safety from gun violence was the focus of a hearing in the Law & Justice Committee that drew more than 1,300 people last Monday. Legislation that would place restrictions on undetectable, 3D printed firearms, a ban on high capacity magazines, stricter regulations on firearms used in domestic violence cases and training requirements for people acquiring a concealed weapon permit all were voted out of committee last week. Monday, Jan. 28 @ 1:30 p.m. The committee will hear bills to prevent families and children entering homelessness by expanding services provided by the Office of Homeless Youth (SB 5470) and strengthening protections for renters facing eviction (SB 5600). Tuesday, Jan. 29 @ 11 a.m.
Senate and House Democrats as well as advocates for safe schools, including Alissa Parker, founder of Safe and Sound Schools, will discuss bills to address student mental health, youth suicide prevention, and access to counselors. Tuesday, Jan. 29 @ 10 a.m.
New legislation (SB 5579) will be introduced to increase public safety and reduce the risk posed by highly flammable Bakken crude oil being shipped by rail through communities across the state. Tuesday, Jan. 29 @ 1:30 p.m.
Wednesday, Jan. 30 @ 8 a.m. Lawmakers will hear testimony on Clean Fuel Standards legislation (SB 5412), one of the most significant measures in the Legislature this year aimed at reducing carbon emissions.